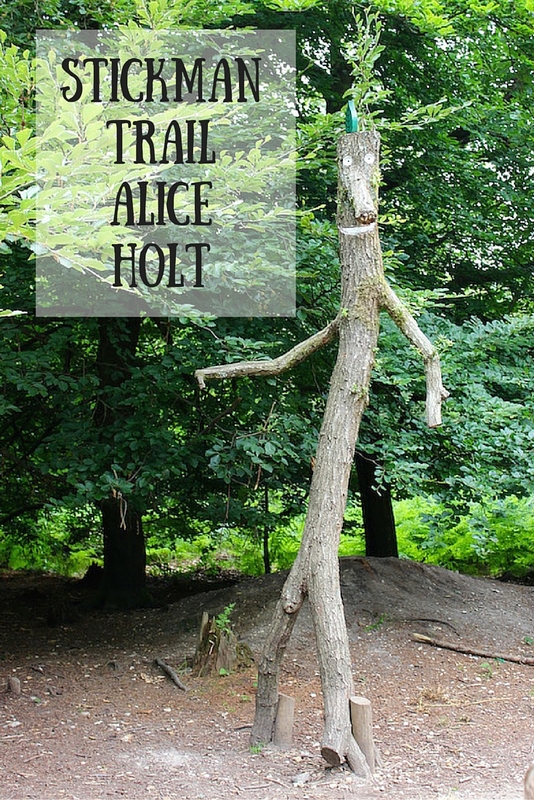 I have been wanting to visit the Stickman Trail at Alice Holt now since the end of last year, however with having Kipper its never materialised. However we found ourselves at a loss last week and decided to pop over there before the trail ends on the 17th July. The good news is that there are others still running, you can find out locations here on the forestry website. You can purchase a Stickman activity pack from the information centre which is now next to the large carpark, its costs £3. It helps Monkey keep his focus and included some paper for bark and stickman rubbings, crayon, pencil, pipe cleaners (for making your own stickman of course) and an activity sheet. The activity sheet is linked to the nine boards located around the trail. 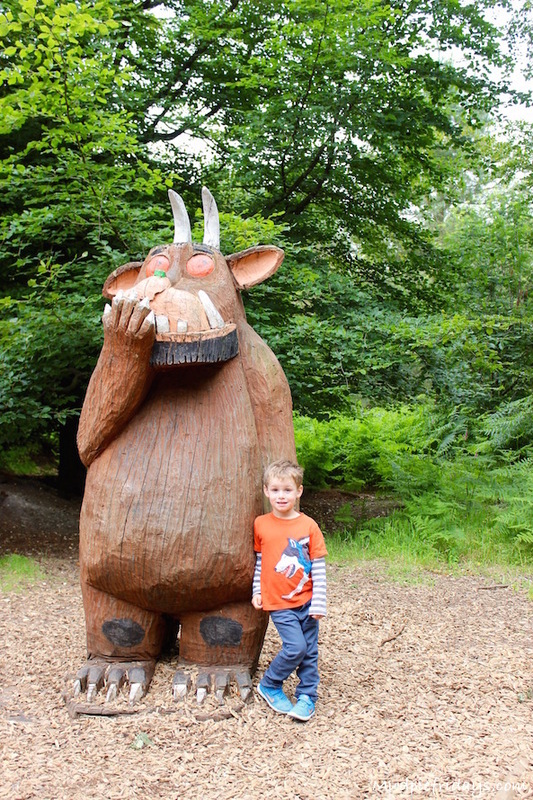 We have been on a couple of these trails before including the Gruffalo and Superworm trails and always find them entertaining. However if you haven’t then the basic idea is there are a number of boards set around a walk through the woodland relating to the story. Each board will have an activity on it which links to the activity sheet in the activity pack. For example the first one was to see how close you could throw a stick to pinecone, the third was to build a nest, which is what Monkey is doing above! Educationally they generally include information about different things you may come across in a forest or linked back to the story in some way. We all really enjoyed this trail as there seemed more things to do that usual. Monkey’s favourite activities were building a stick tower and den building. Kids would need adult help with building a stick tower as the logs (more than sticks) are large and heavy. Monkey had great fun trying to lift the largest ones, we of course had to add a flag to our tower making it a grand 2m high. I did suggest to Hubby that it maybe cheating a little but apparently we were bending the rules to our advantage and thinking outside the box! 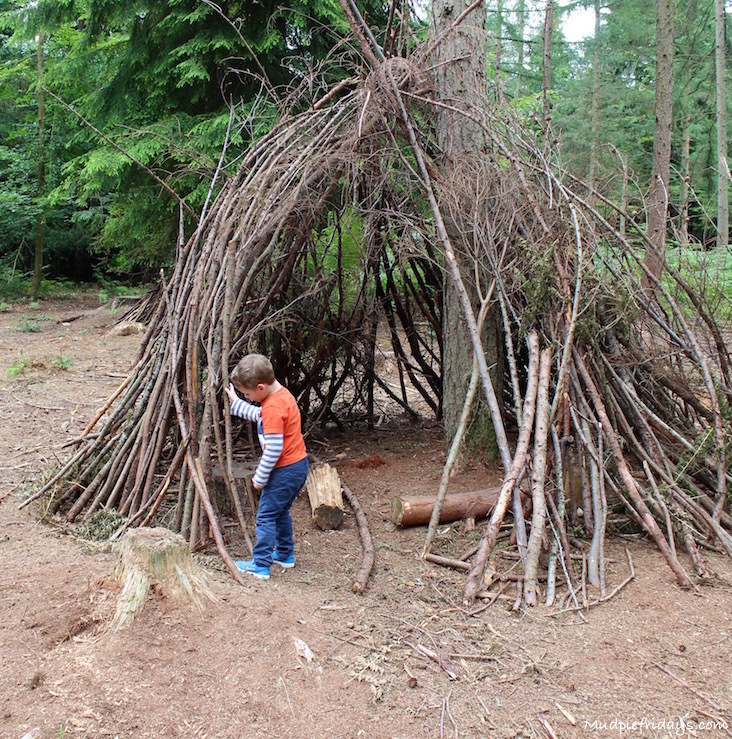 The trail seemed to go through different woodland to the previous Gruffalo trail and towards the end opened up into a clearing where there are several dens built for you to add to or play in. It would be a great spot for a picnic as its large and open with many of the trees removed – I’m guessing they may have fallen rather than been chopped! I had Kipper in the pram all the way round and had no problems and our pram is not exactly designed for being off road (mistake on my part!). 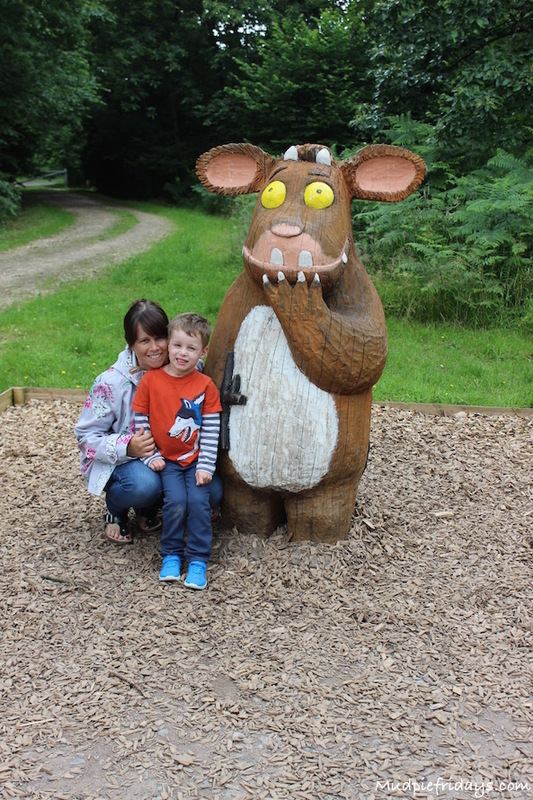 I also really like the fact that they still have both a Gruffalo’s child and Gruffalo statue. Even when they do not have a trail on these remain institu providing a great photo opportunity. After all I don’t know a single child who doesn’t like the Gruffalo. At the end of the trail you get a chance to meet Stickman in person and to make your very own stickman to hang up with the others. Monkey didn’t want to leave his so he ended up coming home with us. To be honest I didn’t time how long we took to walk round and take part in all of the activities. I suspect it took us a good hour and a half, maybe two hours. After we walked back towards the cafe and got an ice-cream, although they are currently improving the space the old cafe is still open. Another improvement is a new play area. They still have the pirate ship area but have added in a new play trail which is right up Monkey’s street. When we visited it looked as though it had only just been opened and is based gorgeous setting in amongst the pine trees. 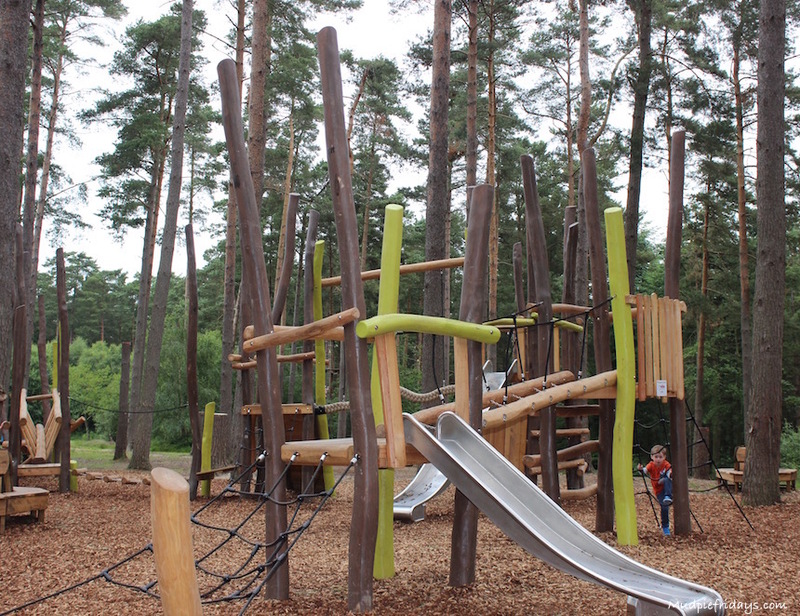 If you know Alice Holt then the best way to reach it is through the carpark up by the Go Ape area. I was really impressed with it especially as they have put in loads of seating which is important when you need to feed a small one! 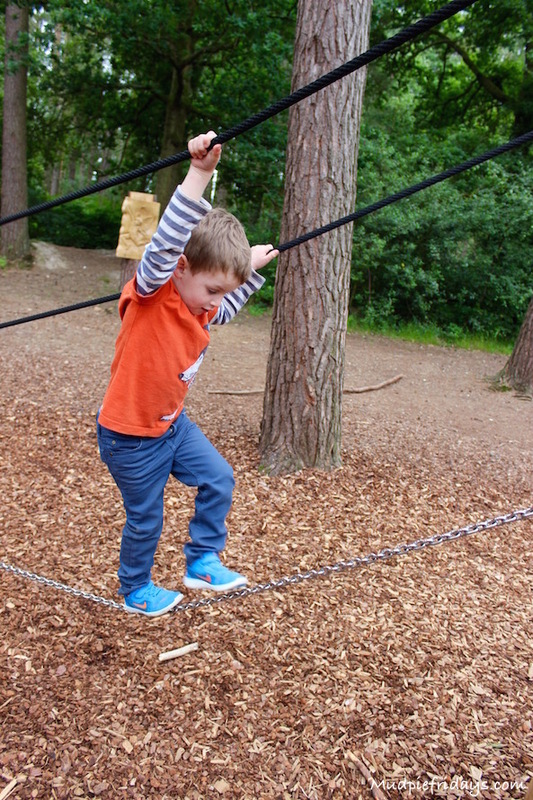 The play equipment essentially goes round in a large circle and has various balancing and climbing activities. Around the outskirts are carved panels with fairies and elves. 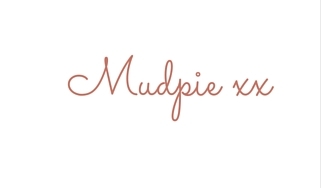 It really is lovely. At four Monkey with a little support could go round the whole things easily enough. I would think younger children would struggle a bit to do it themselves. Although the other play area would cater for them perfectly. I can definitely see us going back to play again. As part of the improvements they have changed the car parking system to a number plate recognition one. You pay on exit and the machines now take cards if needed. Which is just as well as to costs £8 if you are there for over 4 hours, which is a tad on the pricey side and would be my only criticism. Apart from the carpark charges mentioned above its a free day out, so ideal for the Summer holidays!